﻿World Day against Trafficking in Persons: Calendar, History, Tweets, Facts, Quotes & Activities. World Day against Trafficking in Human Persons serves to raise awareness of human trafficking and the protection of victims' rights. Human trafficking exploits humans by forcing them into sexual and labor slave trades. The International Labour Organization estimates that there 21 million victims of forced labor around the world. All countries are affected by human trafficking, participating as either countries of origin, transit or destination. 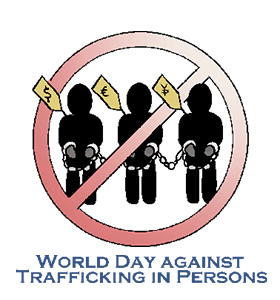 World Day against Trafficking in Human Persons was proclaimed by the United Nations in 2013. Since then, every year on July 30th, the world unites to recognize human trafficking as a serious crime and complete violation of human rights. The theme for World Day against Trafficking in Persons 2017 is Act to protect and assist trafficked persons. According to the U.S. State Department, 600,000 to 800,000 people are trafficked across international borders every year. 80% are female and half are children. Some girls cannot go to school because of child labour and child trafficking. – Malala Yousafzai, Pakistani activist for women’s rights and youngest-ever Nobel Prize laureate. Spread awareness about the day by using the hashtags #WorldDayAgainstTraffickinginPersons and #IGiveHope. Attend the More Than A Survivor: More than a Story Fundraiser in southern California. The event features 22 stunning portraits of women who survived being trafficked and all survived. The event is both a special fundraising event and a way to get educated and help spread awareness about the issue. Donate to charities: Not For Sale, Unisex or Polaris Project. All donations go toward protecting people and communities around the world from modern-day slavery and human trafficking. They have directly supported thousands of people around the world back to lives of freedom and meaning. Learn the signs and indicators of human trafficking so that you can learn to recognize it and report it. US Homeland Security offers a training online free of charge. Watch a movie about human trafficking. Our picks: Taken (2008), Trade (2007), Human Trafficking (2005), The Pink Room (2011), Nefarious (2011), Lilya 4-ever (2002), Eden (2012) and In Plain Sight (2014).